Even though gold prices broke out in a big way to start the year, they’ve reached a lull in February. But this is actually a good thing. Gold was up 3.1% in January alone and was up 10.3% between mid-November and the end of January. Consolidation is not only to be expected; it’s healthy. What we need to watch for now is how long it lasts and how much gold prices correct. In the past week, the price of gold tested the $1,300 level, with buyers stepping in at $1,303 to provide support. U.S. Federal Reserve Chair Jerome Powell’s White House dinner with U.S. President Donald Trump on Monday (Feb. 5), the day before his State of the Union address, made economists uneasy about Fed independence. And President Trump’s speech on Tuesday (Feb. 6) provided little in the way of catalysts, other than possibly helping to buffer the dollar as traders grew weary of trade wars. 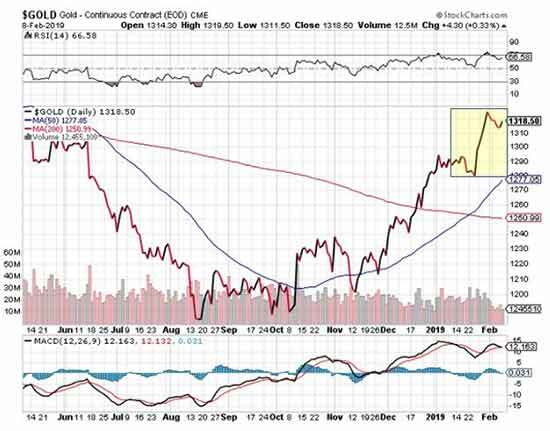 Looking at the movement of gold prices over the last six months, we can see it’s following a unique pattern – what I coined the “golden staircase” years ago. That’s when gold moves up, then sideways, and repeats the process in a discernable pattern over months and even years. So despite a week that brought a relief rally in the dollar, gold still managed to hold its own as it contemplated a period of consolidation. After closing around $1,317 the previous week, the price of gold started out Monday on a weaker tone as the U.S. Dollar Index (DXY) gained some steam. It climbed to 95.85 that morning and then moved sideways. Gold prices weakened initially but closed at $1,312. Gold prices managed to hold around $1,314 through most of Tuesday, even as the DXY climbed above 96. But as the DXY sailed higher on Wednesday (Feb. 7) in the wake of the State of the Union address, gold succumbed and closed the day at $1,306. 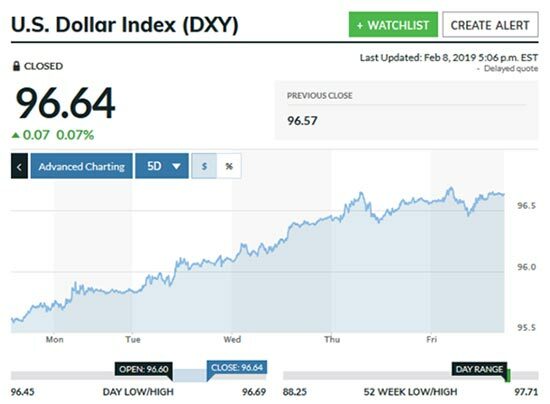 By Thursday (Feb. 8) the DXY had reclaimed the 96 level, but gold rebounded along with it, both favored as safe havens as markets sold off. Gold closed at $1,309. And on Friday (Feb. 9), with flat stock markets and a sideways dollar, gold gained again, climbing steadily to close the week at $1,314. But as I said before, this is a good sign. Gold prices consolidate before moving higher, and that’s been the consistently bullish pattern for gold prices. The dollar has managed to rally in the past week, regaining its 50-day moving average. With this data point, we can see that since the start of this year, both the relative strength index and moving average convergence divergence have turned higher. 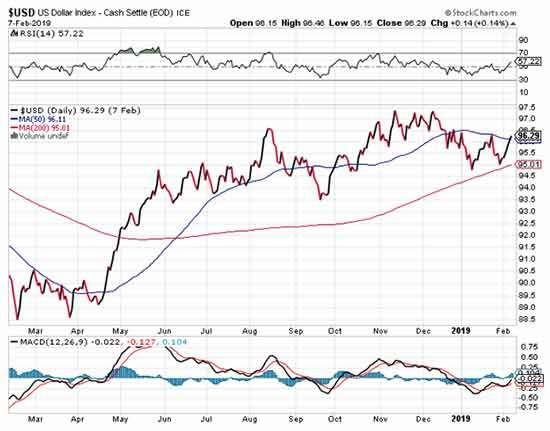 If this continues, then it could be a shift from the dollar’s recent downward trend. While this could be a headwind for gold (and it normally is) it’s interesting to note just how well the yellow metal has held up. In fact, I’ve highlighted gold’s move while the dollar has trended higher on balance since early January. Obviously, the dollar’s relative strength in that period doesn’t seem to have done much to slow gold’s advance from $1,290 to $1,320. And in the following chart, I’ve marked out the “golden staircase” pattern that gold seems to be following since August. Notice how the price consolidates in a sideways range for a time, then climbs, then repeats the sideways move, and climbs again. That’s a bullish pattern that I’ve noticed forms in gold. Interestingly, it tends to happen both on a short-term basis (months) as well as on a longer-term basis (years). On the fundamental side, there’s been some bullish news as well. And it may in fact explain just why gold’s been so strong for the past four months. 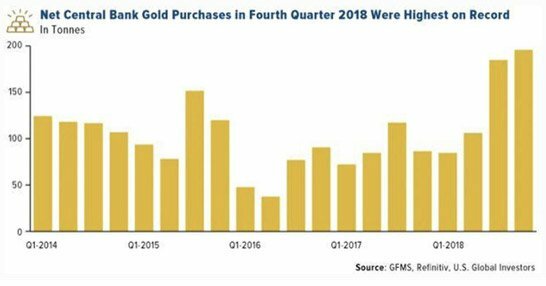 Central bank gold purchases in Q4 2018 were the highest on record, and 2018 was the highest in any year since 1967. In December, institutional investors bought gold ETFs hand over fist, acquiring 76 metric tons and pushing levels last seen in 2013. Then in January, gold ETFs saw an inflow of another 72 metric tons worth $3.1 billion, marking four consecutive months of inflows. Only time will tell, but given how many times gold tested $1,300 as overhead resistance before closing above it, I think it could well be strong support in the current consolidation phase. Right now, gold appears to have entered a new “step stage.” Once it breaks above the $1,325 level, odds are it will climb higher and then form a new step. But first, look for gold to consolidate and digest its recent gains. It’s a well-deserved break.